Attendees at the March 22 Artistic Morning Tea held at Oak hall in Warranwood heard four guest artists speaking with an artistic performance. There was much inspiration from the artists sharing their journeys, techniques and insight in the ongoing development of their art. Beautiful artworks were displayed and for sale. Warranwood Art Show thanks the artists Tracey Roberts, Chris Pittard, Jessie Pittard and Belinda Rogers. Warranwood Art Show thanks the morning tea attendees, the Melbourne Rudolf Steiner School's VCE music students for strings performances and the class 7/8 parents and artshow volunteers for the wonderful array of food and support in what was a sublime morning of art. A musician, singer songwriter and artist, Tracey's unique gift of music-colour synesthesia fills her world and colours her life. “Art and music were always two separate streams of creativity for me until I discovered the word 'synesthesia' and then the connection between art and music became completely interlocked”, Tracey explains. Synesthesia is the experience of seeing colour and shapes associated with hearing music. Each synesthetic experience of colours/shapes is different and we can experience music within colour, such as seeing the crotchet-like stamens in the colorful poppy. A spellbound audience experienced sensing into colour as Tracey performed her song 'Somewhere Green' part of her cd 'Shades of Blue'. The performance brought awareness, comprehension and a glimpse of music/colour synesthesia through her music. See and hear more about Tracey Roberts. Don't miss Tracey during the Dandenong Ranges Open Studios 5-6 May 2018 and a group exhibition at Burrinja Gallery from 28 March to 6 May 2018. Artist Chris Pittard's paintings and drawings from his sketchbook and travels can often be seen on his ceramics. Chris's advice to artists is to "put that piece in! Don't leave it till next year." 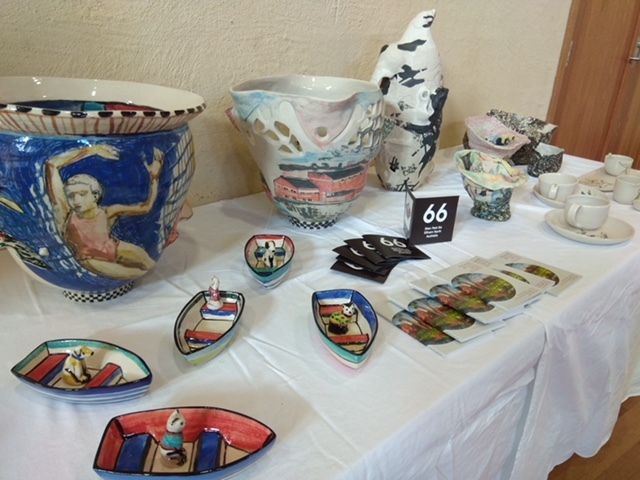 Chris exhibited in Paris with several Australian potters who were invited to exhibit alongside French potters at the Craft Association of France. 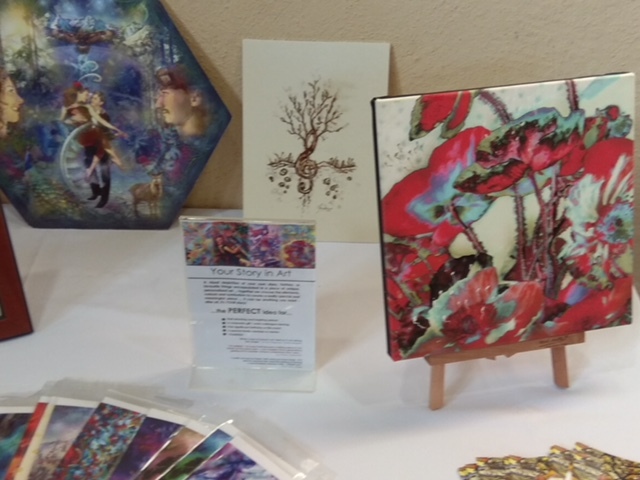 Travelling extensively through France, Chris and fellow potter, Jane Annois with Zeste French Tours who run numerous art, food, wine and walking tours throughout France. Chris spoke about the popular potters markets in France, England and other parts of Europe which attract thousands of visitors each year. Speaking of his larger ceramic pieces, Chris says these are often a lengthy yet joyful process with the soothing quality of the clay, handbuilding each piece with coils over several days, often painting both inside and outside each large sculptural piece. See more of Chris Pittard's ceramics and paintings during Nillumbik's Open Studios (5-6 May 2018) and at Montsalvat's Barn Gallery until April 1st 2018. Jessie grew up with ceramics but completed all of her fine art training as a printmaker, she now works full time practises both her printmaking and ceramics. Jessie began her talk explaining the different traditional printing method that she learnt while studying before she began to explore more alternate methods of creating her art. One of Jessie’s artworks depicts indigenous plants in Melbourne, where close to 400 individual pieces were hand cut and assembled within the work. A small section of this work was selected for a group exhibition in St Petersburg called Flora Fantasia. Jessie also shared another of her paper installations, this one using a printing process called Collograph, a technique that uses recycled material such as cardboard to carve in the designs before printing on rice paper. Jessie now talks about how she began to introduce several printing techniques into her sculptural ceramic work, such as digital transfers and direct relief printing. She explains she wanted to play and explore sculpting with 3D because it offered something different to working with paper. Jessie utilises different printing skills on her functional ceramics ranges explaining that she used to hand paint each piece until she discovered this alternate process of decals. 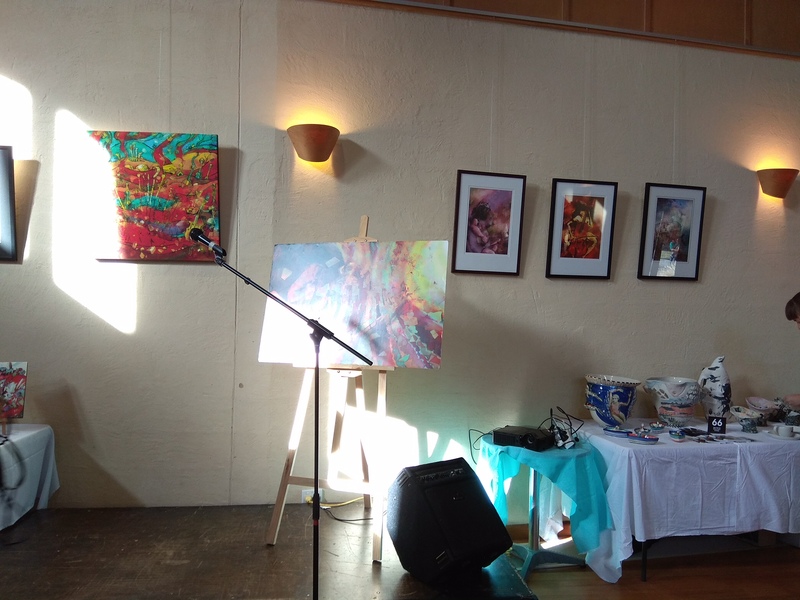 Jessie's artwork is also currently exhibited at the Barn in Montsalvat until April 1st, forming part of the Nillumbik Open Studios. From the beginning, Belinda was always inspired by nature, her mother encouraging her to see its flawless beauty. She found solace in the old poets writing endless poems and sketching in nature. "Poetry was my first love," she says. “I watched as the artists tried to perfect their work, whilst under their very feet was the untamed beauty, the splatters and spills, a flawless composition of trial and error that was perfection itself”. Belinda endeavours to engage in as pure an experience as possible. Her tonal work a breakthrough in her method of withdrawal, reduction, refining before another encounter of colour on the palette. "I use oil straight off the tube", she explains of her process of mixing paint, using cloth or found objects in nature. She paints a layer then scrapes back, adds another layer and scrapes back. "Its something I can walk into and that invites me to enter," she shared about her process. Asked about her love of large canvases, Belinda spoke of joyful feelings of immersion with her periphery fully immersed within the work. Painting from Montsalvat Belinda says, "For someone like me, it is perfect". Hear Belinda Rogers poetry and see her art at thedreamingseed and at Montsalvat. 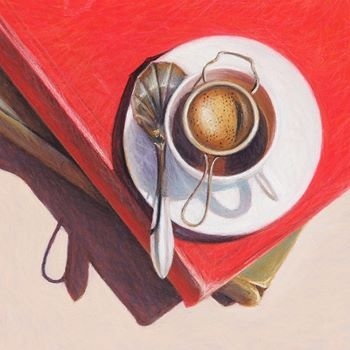 Warranwood Art Show thanks Kylie Sirett who has generously donated her beautiful colour pastel work, Tea Readings, for raffle at Warranwood Art Show’s April 2018 Exhibition. Next event is the Warranwood Art Show April 27-29 Opening Night gala and Exhibition Weekend in 2018.